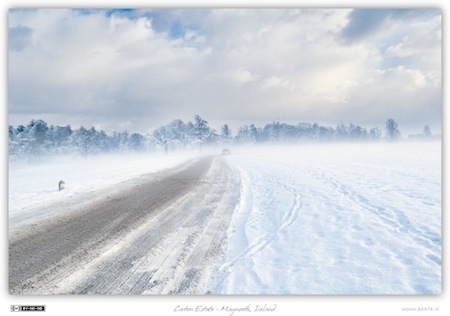 For some strange reason I got an urge to post one of my winter shots today, even if it is June. In photography there are only ever guidelines, there are no hard and fast rules. Every guideline can be broken if you do it right. A guideline I always follow is never to shoot trains as they move away from you, but to catch them coming towards you. I simply hate seeing a shot perfectly composed to imply motion towards you, only to notice the red tail lights on the ‘front’ of the train. Perhaps I’m being a bit too much of a perfectionist, but it really bothers me. This shot however proves that rule are made to be broken. 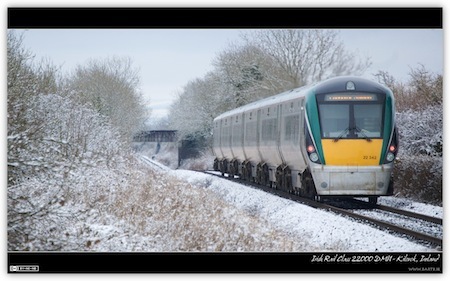 Here we see an Irish Rail InterCity service making it’s way from Sligo to Dublin moving away from up in the frame towards the bridge in the background. To try to imply the motion even for those not pedantic to notice the tail lights, I composed the shot with the back of the train deliberately close to the right edge of the frame. Due to a few busy weekends in a row I’ve gotten very behind again, so I have a triple post this weekend to get caught up. As usual when I do a multi-week Photo of the Week, I’ve picked a theme that relates the photos to each other. In this case, they were all taken during the abnormally long and harsh cold spell at the start of January this year (you can see all my best shots in a Set on my Flickr stream). 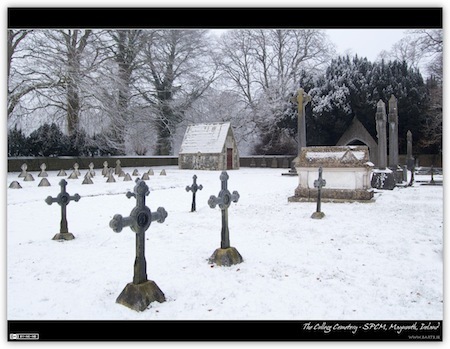 The first shot I’ve chosen is of the College Cemetery in St. Patrick’s College Maynooth (SPCM). This cemetery is almost like a secret garden, hidden away behind some lovely old trees near the back of the grounds. It’s always a wonderfully peaceful place, especially in the snow. Fr. Nicolas Callan is buried here. He was a great scientists who worked in SPCM and is most famous for having invented the induction coil. 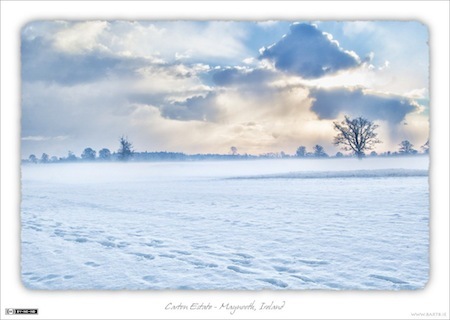 The second shot I’ve chosen was taken on a ground of Carton Estate just outside Maynooth village. I’d been cycling along the Royal Canal where the sun was beaming down and it was just a truly beautiful clear day. Then, the moment I left the canal and entered into Carton estate it was like I’d beamed to another world. There was this thin later of dense mist hovering just above the ground. Above that layer it was still a beautiful day, though clouds were starting to roll in. The layer of mist gave the whole place an ethereal feel. I’d honestly never seen anything like it. To be honest none of my shots did the scene justice, but I still really like this one. 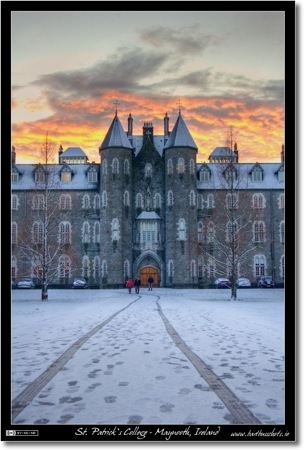 Processing: This shot was generated by first applying the Topaz Adjust 4 filter to effectively tonemap the image, and then tweaking the result a little in Photoshop Elements 8 to selectively brighten just the snow. Perhaps unsurprisingly, I’ve also chosen one of my train shots as one of my favorites. This shot was taken as the day was ending and the sun was getting very low in the sky. 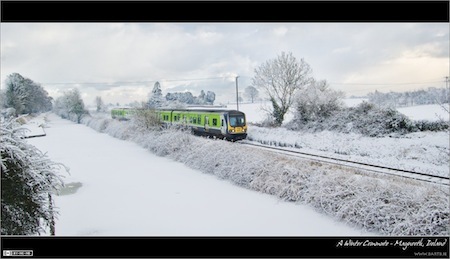 It shows an Irish Rail InterCity services making it’s way from Dublin to Sligo as it approaches Jackson’s Bridge just beyond Maynooth. 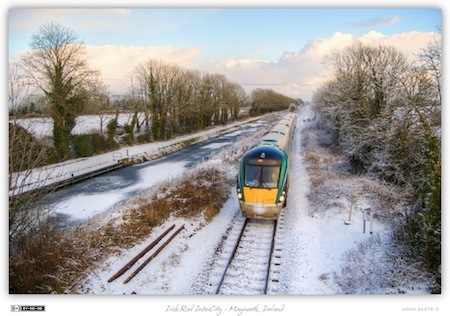 From Jackson’s bridge you get a view of both the railway and the Royal Canal which runs next to the track for most of the way between Dublin and Mullingar. Processing: This shot was generated by tonemapping the original RAW file with Photomatix Pro, and then tweaking the results a little using Aperture’s Dodge & Burn plugin. When I think of Winter one of my shots stands out above all others, this one in fact. 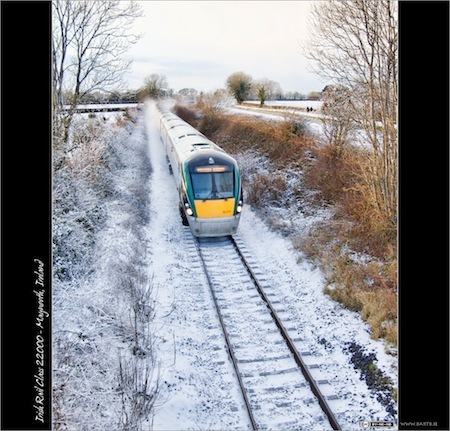 It was also taken at the very end of December, all-be-it back in 2001, so it seemed appropriate for this week’s photo of the week. Unfortunately the photo quality is very poor, which is the main reason I haven’t used it as a photo of the week before. It was shot on a second hand and fairly early digital camera, and the memory card I had for it was far too small, so I used it at a very low quality setting. Because of this the image is small, and has a lot of JPEG artifacting, but I absolutely love it all-the-same. 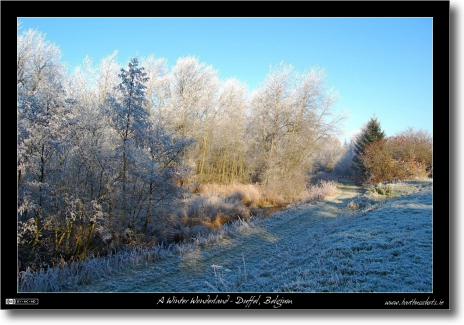 This shot was taken in the town of Lier, in the province of Antwerp in Belgium. Lier is a very unusual place, it’s absolutely brimming with canals and waterways, a lot like Brugge in fact, but much less well know. Historically it was also an enclosed town, and the remains of that enclosure are what are referred to as ‘de Vesten van Lier’ in Flemish, and it’s on the south eastern region of this enclosure that this photo was taken. The ‘Vesten’ were once the city walls, but they were knocked a few centuries ago and became a long thin park completely surrounding the town. Lier sits at the point where two important Flemish rivers, the Kleine Nete and the Grote Nete, merge into a single even more important river, the Nete. The two rivers meet at the north of the town, and the joint river snakes around the eastern side of the town. In order to protect the town from flooding, a canal was dug around the western side of the town connecting the Kleine Nete to the Nete, this means the town is completely enclosed by water. On top of this the entire interior of the town is criss-crossed by canals so there is water just about everywhere you look in Lier. Unfortunately the EXIF data has gotten lost from this file so all I can say is that I shot it with a FujiFilm MX-2700 point-and-shoot. With this double-post I’m finally back on schedule with my photo of the week. Since this is a double-bill I decided to pick a theme, these are my two of my favourite pics shot in my native village of Duffel in Belgium. 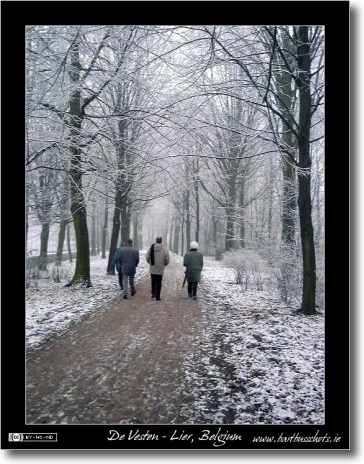 The first is a fantastic winter scene that greeted me on the first day of my Christmas holiday in December 2007. When you combine a very thick fog with a very heavy frost followed by a clearance in the morning you get an almost fairy-tale-like scene. I took quite a few shots but this is the one I think worked best. 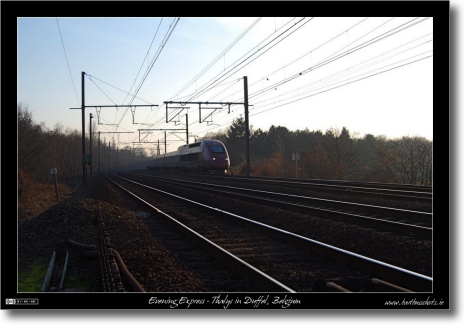 The second shot is of a Thalys express train passing through Duffel with an international express train from Brussels to Amsterdam. These trains are actually French TGVs in a different coat of paint and are part-owned by the national rail companies of France, Belgium, The Netherlands, and Germany. There are very few places where you can get photos of electric trains without pylons in the way, the rail bridge in Duffel is one of those rare places. 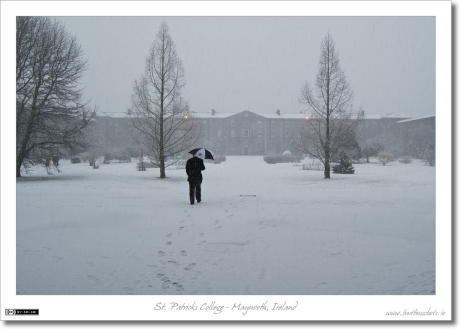 This photo was taken on the morning of the 21st of December 2007 in St. Joseph’s Square on the South Campus of NUI Maynooth. 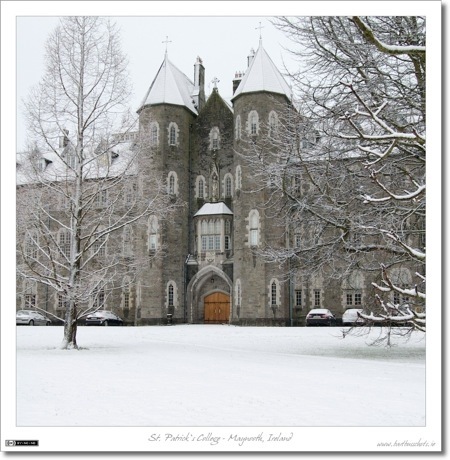 St. Joseph’s Square is at the heart of the historic old campus in Maynooth and is the home of St. Patrick’s College Maynooth as well as NUI Maynooth. 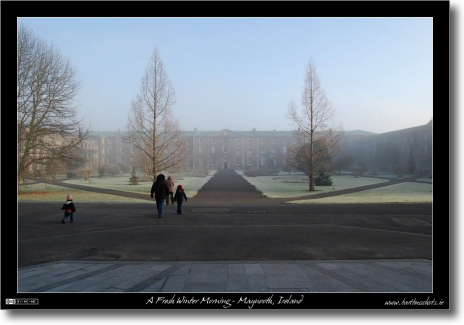 As well as housing academic departments the old campus also doubles up as a park for the residents of Maynooth who love to walk in the picturesque grounds.